Perryton, TX– Republic Forge, manufacturer of world-class Model 1911 pistols, will be present and in full force at the 2015 NRA Annual Meetings and Exhibits in Nashville, Tennessee. Republic Forge welcomes all attendees to visit their show floor booth, #1063, and see the industry’s premier, American made, 1911s! The Republic Forge booth will feature a wide array of their officer, commander and government model 1911s, all crafted with a unique blend of cutting-edge technology and custom craftsmanship. The 144th NRA Annual Meetings & Exhibits will take place April 10th through the 12th in Nashville, Tennessee. The Exhibit Hall is FREE to all NRA Members and their immediate family. Perryton, TX- Republic Forge, manufacturer of world-class, truly American made Model 1911 pistols, is pleased to announce that Battle Mug, of Monteagle, Tennessee, has won Republic Forge’s first “Build It To Win It” Dealer Contest that took place at the 2015 SHOT Show. 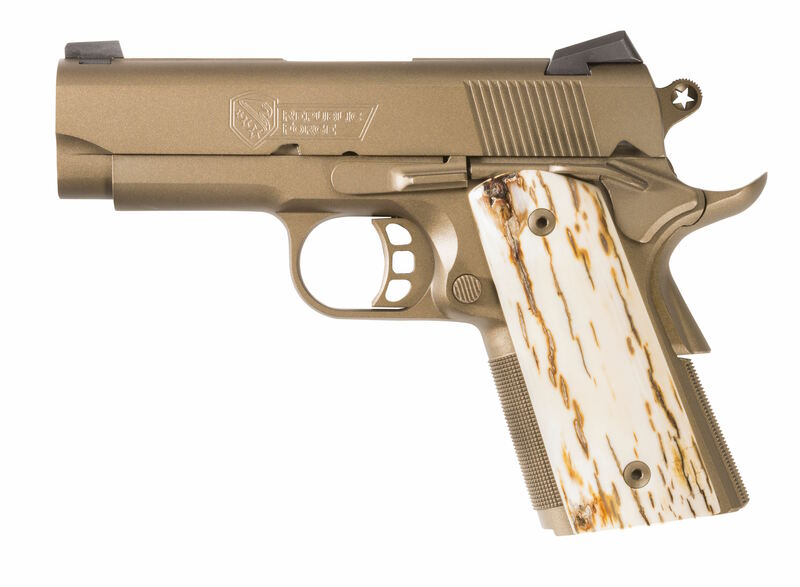 Drawn alongside numerous dealer entries, Battle Mug will be awarded their very own, custom 1911! The “Build It To Win” contest created quite a stir amongst media and dealer personnel at the 2015 SHOT Show. Dealers were asked to visit Republic Forge’s show floor booth or Industry Day shooting lane, demo or “Build Their Own” 1911 utilizing Republic Forge’s cutting-edge website technology, and leave behind their company business card. Republic Forge, manufacturer of world-class, truly American made, Model 1911 pistols, is excited to announce they will be returning to SHOT Show and Industry Day at the Range! 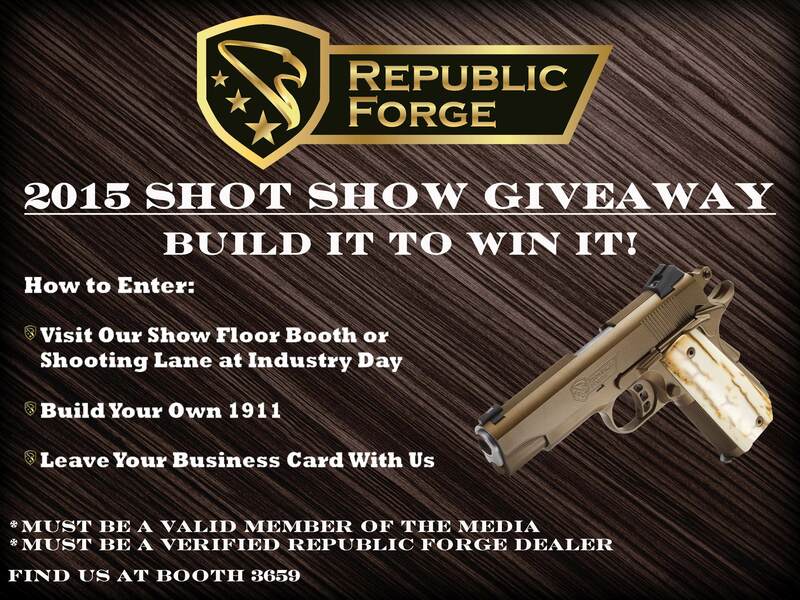 Republic Forge welcomes all professional media members and dealers to visit their show floor booth, 3659, or shooting lane, at Industry Day at the Range, for a chance to win a FREE Republic Forge 1911 pistol. Republic Forge will be giving away ONE FREE 1911 to ONE lucky SHOT Show media attendee. To enter this exciting giveaway, simply visit either Republic Forge’s show floor booth or Industry Day shooting lane, demo or “Build Your Own” 1911 utilizing Republic Forge’s cutting-edge website technology, and leave behind a business card. Republic Forge will be giving away ONE FREE 1911 to ONE new or existing Republic Forge dealer attending this year’s SHOT Show. For entry into this giveaway, dealers can visit either Republic Forge’s show booth or Industry Day shooting lane, demo or “Build Your Own” 1911, and leave behind your business card. In order to qualify for this exciting offer, participants must be established Republic Forge dealers. New dealers who sign up at SHOT Show will also be eligible for the giveaway. These two “Build It To Win It” giveaways will begin this Monday, January 19, at Industry Day at the Range and run through the final day of SHOT Show, January 23, 2015. Following SHOT Show, ONE Republic Forge dealer and ONE professional media member will be randomly selected and awarded their very own custom 1911 from Republic Forge. 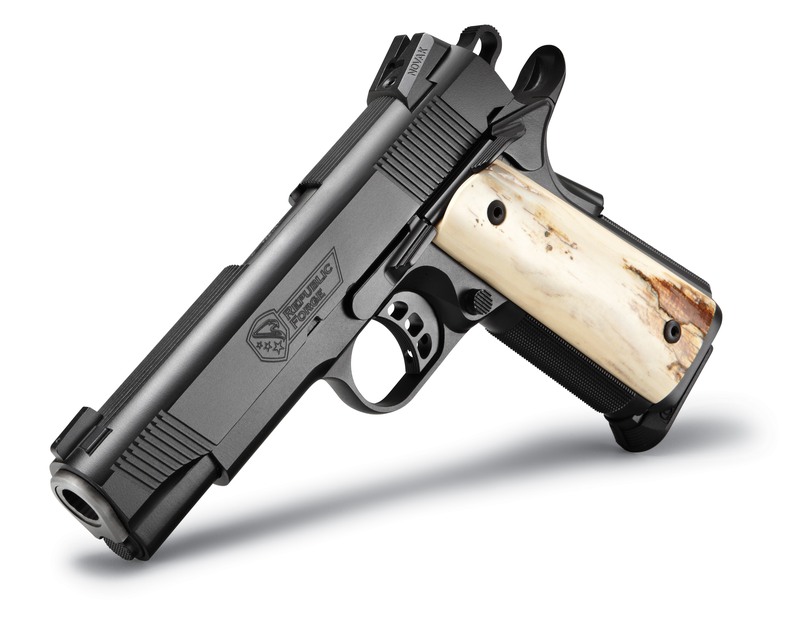 *The awarded 1911 value shall not exceed $2,800 MSRP.